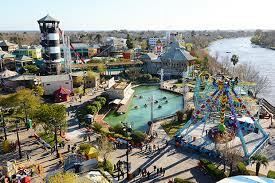 The park, located on a 14 hectares (35 acres) lot along the Paraná River Delta (on the Luján River), was developed by Santiago Soldati, whose family holding company, SCP, had been bolstered by record earnings in its Compañía General de Combustibles (CGC) unit, an energy sector distributor, during the early and mid-1990s. Its development was preceded by the Tren de la Costa, a 16 km (9.9 mi) tourist light rail line inaugurated in 1995, and connecting Vicente López (just north of Buenos Aires) with the northern suburbs. Following an investment of nearly US$400 million, the Parque de la Costa was inaugurated on April 10, 1997. The park, connected to the light rail line at the latter's Delta station, originally included Tronador (a Pinfari Zyklon Loop rollercoaster), El Dragón water coaster, the La Vuelta al Mundo ferris wheel, El Octógono stage, an amphitheatre, a musical fountain, and other attractions. The park's projections of 3 million visitors a year failed to materialize, however (traffic was about half that amount). A series of investments in the late 1990s, including the installation of two, larger rollercoaters (Boomerang and El Vigia), the addition of more live performances, and its reorganization into a theme park, as well as cost-cutting measures, reduced the unit's losses. 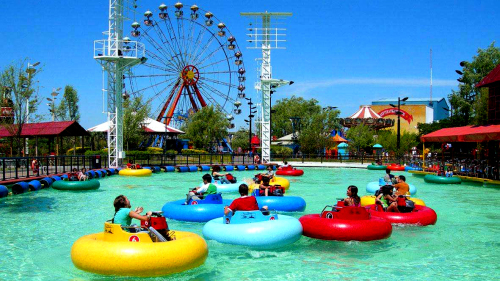 Debts at SCP of over US$750 million continued to jeopardize its operations, however, particularly following incidents in 1999, in which two rollercoaster passengers entered into a coma, or lost their lives, allegedly due to the ride's excessive speed. A two-thirds share in the park, which netted around US$30 million in annual sales, was transferred to SCP's creditors after the company entered into an bankruptcy proceedings in 2000; a major project, the Rapidos del Delta water ride, was cancelled as a result, though other rollercoasters, built by the Dutch firm Vekoma, were opened in subsequent years. The park and Tren de la Costa (which remained in SCP ownership) helped revitalize the mainly upscale real estate market in the northern suburbs of Buenos Aires.